Ian L. CC0/Public Domain license. All across the country right now, major wireless Internet Service Providers (ISPs) are talking to legislators, mayors, regulators, and the press about the potential of 5G wireless services as if they will cure all of the problems Americans face right now in the high-speed access market. But the cold hard reality is the newest advancements in wireless services will probably do very little about the high-speed monopolies that a majority of this country faces. According to a ground-breaking study by the Institute for Local Self-Reliance, more than 68 million Americans facing high-speed cable monopolies today. This is why we see wild claims about how 5G will do things like solve rural America’s lack of access to broadband or that wireless broadband will be just as good as any wireline service (it won’t). In reality, we are already woefully behind South Korea and many countries in the EU. In essence, 5G is being aggressively marketed in policy circles because it provides a useful distraction from the fundamental fact that the United States market is missing out on 21st century broadband access, affordable prices, and extraordinary advancements coming from fiber to the home (FTTH) networks. Rather than aggressively wire the country for the future, major competitors to cable companies are opting for 5G because it will cost about half as much as FTTH to deploy and allows them to avoid directly competing with cable. In effect, they are splitting the market with each other and hope policymakers do not notice. To date, major ISPs poised to compete with cable companies like Comcast and Charter have billions of dollars (including additional billions after Congress cut the corporate tax rates) but have chosen not to widely deploy FTTH networks that vastly outperform current cable systems. The fact is they have made it clear they do not want to spend the money to build FTTH (Verizon stopped eight years ago now whereas AT&T’s limited fiber build is mandated as a merger condition). This is not because these networks are unaffordable. In fact, nearly half of the new FTTH networks being deployed today are done by small ISPs (which the FCC might stifle next year on behalf of AT&T and Verizon) and local governments, which have limited budgets. If the corporations with the most resources are unwilling to challenge cable monopolies, it means we have a failure in competition policy and consumers will pay substantially more than they should for high-speed Internet access. When we look at the parts of the country that have multiple options for high-speed services, we see symmetrical (i.e. the download and upload speeds are equal) gigabit services selling from a range of $40 a month to $80 a month. It is worth noting that in the absence of protections against “redlining,” the practice of only selling broadband access to wealthy neighborhoods, many times these areas already tend to be at the top of the economic ladder. However, in the markets that now have gigabit cable services but no FTTH competitor, the price for broadband jumps dramatically for no reason other than a lack of choice. So whether you live in a big city like Miami, Florida (where you pay $139.95 a month), or smaller cities like Manchester, New Hampshire ($104.95 a month), or Imperial, Pennsylvania ($104.95 a month), the story is the same. 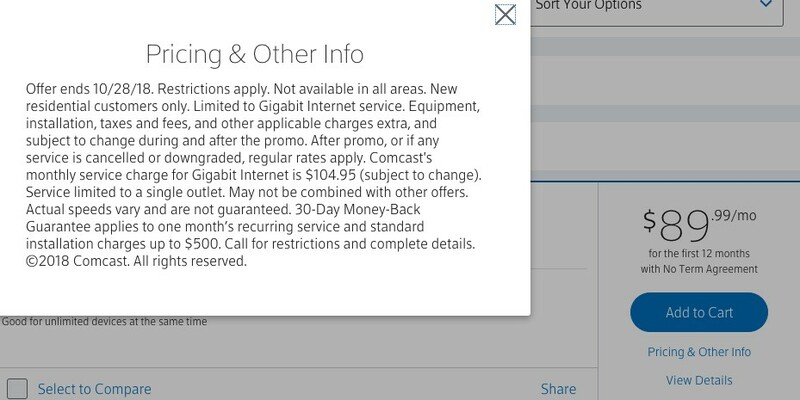 In my own backyard, I would have to pay close to quadruple ($159.95) the competitive price for gigabit service because of my cable monopoly, while my coworkers at EFF living in San Francisco are paying $40 for a superior service. There is no real comparison between the proven Internet access speeds provided to users through a FTTH connection and what potentially may arrive through 5G wireless in some unknown distant future. Seven years ago, a single strand of optical fiber was able to transmit 100 terabits of information per second, which is enough to deliver three months of HD video per second. Three years ago, an ISP launched 10 gigabit speeds in the United States because it already had a FTTH deployment to leverage (and upgrading FTTH is cheap). 5G systems are just about to enter the market, but nothing has been shown to demonstrate it competes with gigabit cable networks. Current estimates for 5G wireless services are showing that the median user experience is somewhere between 490 Mbps up to 1.4 gigabits per second and the upward trajectory for wireless speeds are limited by a lot of different factors including some that are outside the control of the technology itself. Things like interference from other signals, physical obstructions (they are dependent on line of sight), multi-year government spectrum allocations, and the shortening range of towers for ultra high speeds (estimated around 1000 feet per tower) all serve as limitations on wireless potential. Fiber optic lines, however, have a clear path forward to increasing their capacity as the electronics themselves become more advanced. Recent innovations in increasing the number of signals that could be pushed through the glass pipe have meant increases in capacity are decoupled from environmental or government restraints that exist for wireless. For example, time and wavelength division multiplexed passive optical network technology has literally meant previously existing fiber optic deployments will be upgraded without a single new wire being replaced and is yielding at least ten times the capacity. The basic formula for how ISPs monetize their network is a fairly straightforward balance between revenues and expenses, as well as one-time sunk investments associated with upgrades and laying the network (usually handled through some financing vehicle repaid over time). Revenues come from the monthly subscriptions people pay for things like telephone service, television, and broadband. Their expenses come from the maintenance cost of the network including employees repairing the system and customer service. The larger the network becomes, the greater the expense to maintain it, the more customers they need to sustain profits. It is these factors that make rural broadband so challenging. Rural areas by their very nature are more spread out with fewer potential customers (this is why we see a rise in rural coops where people build their own ISP that isn’t solely focused on profits). The US Department of Agriculture’s Rural Utilities Service (which provides loans for building telecom services) defines rural as areas where the local community population is less than 20,000 and that it is not closely adjacent to an urbanized area of 50,000 or more people. The US Census Bureau defines rural America as areas where no more than 1,000 people per square mile reside. When you take the economics of an ISP and map it over rural America, you quickly see that they have fewer revenue sources and higher expenses than a more densely populated urban area. You will need a lot of extra 5G towers to cover the territory while dealing with geographic barriers such as forests or mountains that will physically interfere with the wireless transmission. In fact, what is ironic is you need a significant deployment of fiber to make rural 5G possible, where one should question why not just go all the way to FTTH. When the Senate Commerce Committee recently held its field hearing in South Dakota, a witness explained that Sioux Falls coverage will require 350 towers for 74 square miles but given that the rest of the state has an average density of 11 people per square mile, it is unrealistic to get their hopes up that 5G wireless will present a revolutionary solution. The solution to rural America’s problem, in the end, is the same solution we adopted for electricity, water, and the roads. We start treating access to the service in the same way we look at essential infrastructure rather than a private luxury. We adopt policies that promote fiber’s construction and return to the Telecom Act’s fundamental goal, which was to ensure all Americans had universal affordable access to communications services no matter where you live. 5G wireless is important for mobility, but its only one piece of the broadband future and should be treated as such. New innovations to wireless technology such as “network slicing” along with ways to address autonomous vehicles and the Internet of Things are valuable, but it should be recognized that they will be separate from broadband access competition in the high-speed market. We should be asking our elected officials and regulators what are they doing to help bring high-speed competition and get approximately 68 million people out of their cable monopoly. To date, the Federal Communications Commission (FCC) has largely ignored this problem claiming that its complete abdication of authority over the ISP market will solve it for us (and we are seeing how that is going right now). Or worse yet, that monopolies are ok because potential competition is as good as actual competition. But with each passing month consumers are paying too much for their service, or simply have no service at all, and the United States’ Internet will continue to languish behind its international competitors.